Students and scholars of Latin, history, and literature will find this to be an outstanding book that offers insights into the lives of Cicero and Asconius, as well as a fascinating look at Rome in the first century BCE. 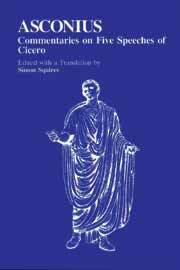 Commentaries by Asconius are included with the text and translation of these speeches by Cicero: In Pisonem, Pro Scauro, Pro Milone, Pro Cornelio, and In Toga Candida. The book provides an essay on the life and works of Asconius, notes on sources, a bibliography, catalog of Asconius's errors, a glossary, and a proper name index.